The day had finally arrived, with great anticipation I was planning my day around the afternoons opening match of the season. I was particularly excited that here in Hanoi I am fortunate enough to live within a 25 minute walk of the Hang Day stadium and had started to fantasize about walking to the game and being swept up among a yellow and blue ocean of fans. Two hours prior to kick off and the clouds start rolling in. Hanoi has the ability to become very dark, very quickly, in the middle of the day. The rain started. Rain and an ocean of fans, I was definitely walking! A strange thing then began to happen; the nearer we got to the stadium, the fewer people there seemed to be. An hour before kick-off I could see people through a gap in a gate already sat in the stands. Were fans really arriving early to get the best seats? Had my odd excitement passed on to others and T&T were expecting a bumper crowd for the opening day? As it turns out neither. 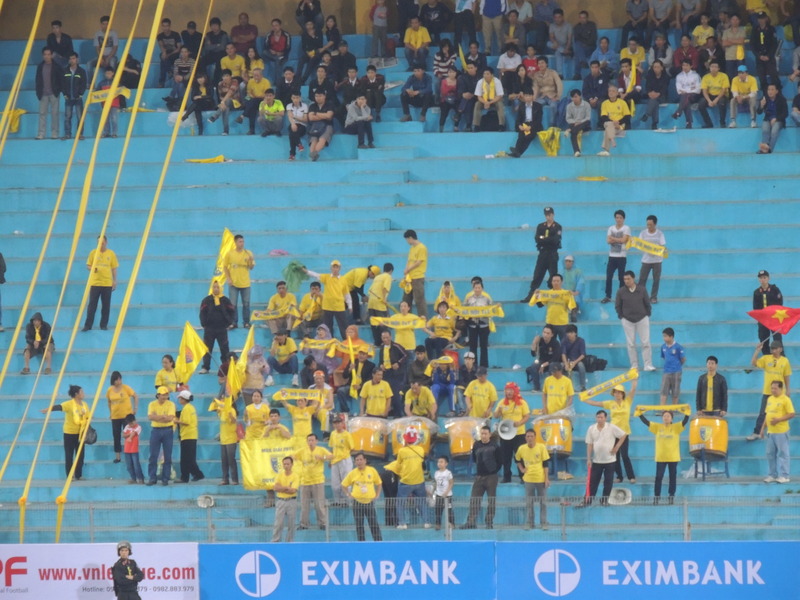 We sat in an empty cafe near the entrance to the Hanoi Fans section; we waited and watched. As one loyal fan pulls up with two huge mega phones attached to the back of his motorbike, I wondered if this was the first of many. Then two more fans in bright yellow shirts casually strolled in to view. This must be it I thought. But as it dawned on us that the streets around the Hang Day stadium were particularly empty, especially for Hanoi on a Saturday afternoon, we realised the ocean may just be one of those small trickles of water that occasionally seeps down the side of a building for no particular reason. 40,000 VND lighter and we were in. The game was here. The Hang Day stadium is a little run down but has plenty of character with two large stands running down either side of the pitch. 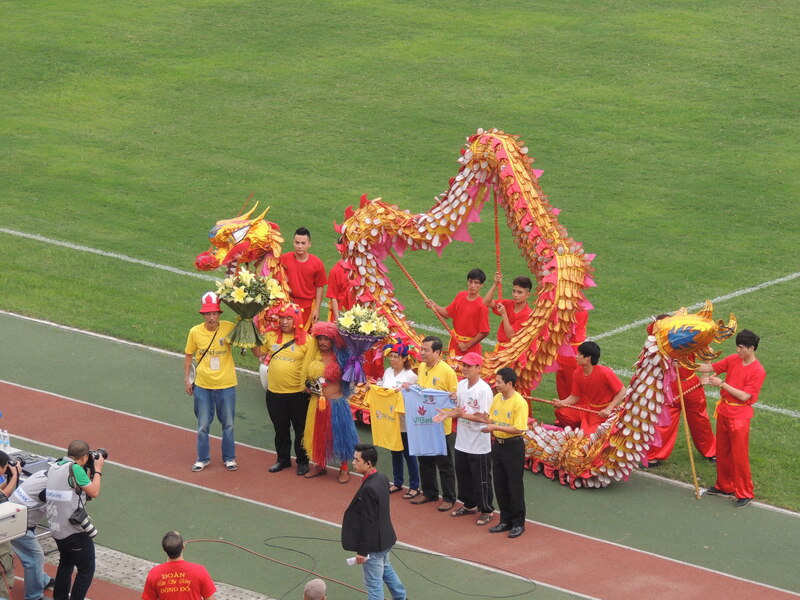 The kick off was slightly delayed, not due to crowd congestion, but by various presentations and introductions, all I think were linked with it being the opening game. It turns out there are a few very loyal fans, possible the leaders/organisers of the fan groups, as one member from each side was on the pitch to exchange pleasantries and pose for photos. To be one of these fans you seem to have to wear fancy dress, with the Hanoi representative sporting a rather fetching red Ruud Gullit style wig. This is the same fan I was sat in front of at the recent Vietnam v Malaysia international, who is also in charge of leading the songs through one of the numerous megaphones. A great character, who clearly loves his football. The first half of the game was a good encounter, with HAGL setting up with 5 at the back and inviting the T&T attackers to try to break them down. 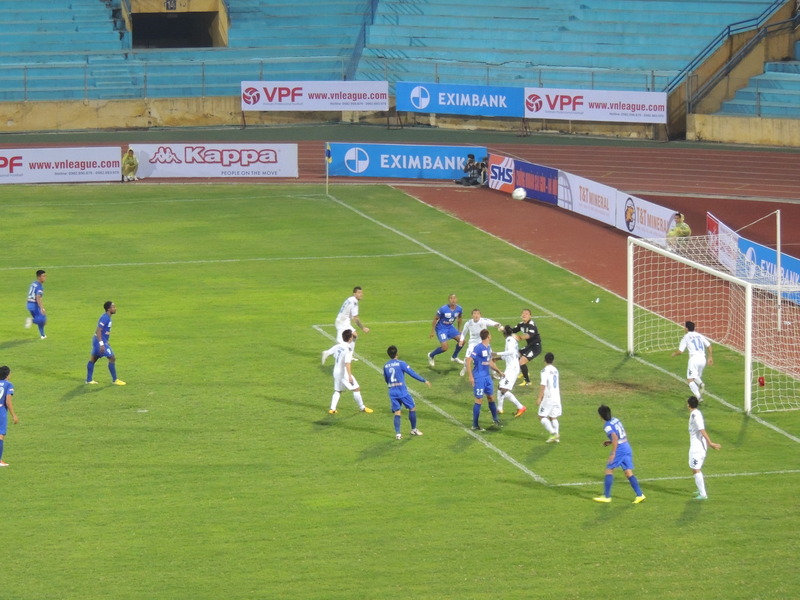 This allowed the lively Samson Kayode and Ngoc Duy plenty of possession coming in from the flanks, with the latter watching one effort come back off both posts. Akpan in the HAGL goal then made a couple of good saves, one particularly good effort from the T&T full back Quoc Long. The breakthrough soon came, in scrappier fashion from a corner as Marronkle scored the opening goal of T&T’s season. The team celebrate and there was an air of excitement in the stands too, not just from me! The second half didn’t quite match the quality on show in the first. T&T thought it best not to give the ball to their most effective player, Kayode and opted for a more hit and hope approach, to no avail. On the contrary the opposing forward pairing of Evaldo and Oseni had woken from their first half slumber and began linking up well. Then it happened, something that I’d experienced before when watching football in Vietnam; after an enthralling first half the players from both sides had decided enough was enough, and so the time wasting, diving, innocuous tackles and play acting began. The whistle barely left the refs lips. A shame really as the first half was great and HAGL were only wasting their own time whilst T&T were never safe at just 1-0. As it continued the supporters began showing their disdain for this style of play. With ten minutes remaining the game sprang back in to life; T&T realised Kayode was in fact a team mate and with an acute reverse pass, he powered his way past the last centre half and smashed the ball beyond the impressive Akpan. Cue wild celebrations from the pitch and the stands; the first three points of the season were secured. Akpan was not a happy goalkeeper though, proceeding to charge his way to the centre circle to remonstrate with the refefee before heading to the fourth official for some more. Embarrassingly for the keeper’ this went on for quite some time; strangely the referee finally decided to book him for ‘leaving the field without permission’ when arguing with the fourth official. An odd rule barely enforced, not sure why he didn’t send him off for the abusive language that was clear to all. This meant the remaining few minutes were a little heated and some slight gloss was taken off of Hanoi’s victory when Sy Cuong was shown a straight red in stoppage time for a reckless lunge. The final whistle went, the 3000 (approximate, not sure if official numbers are ever released) fans cheered and clapped their respective teams and hurriedly made for the exits. 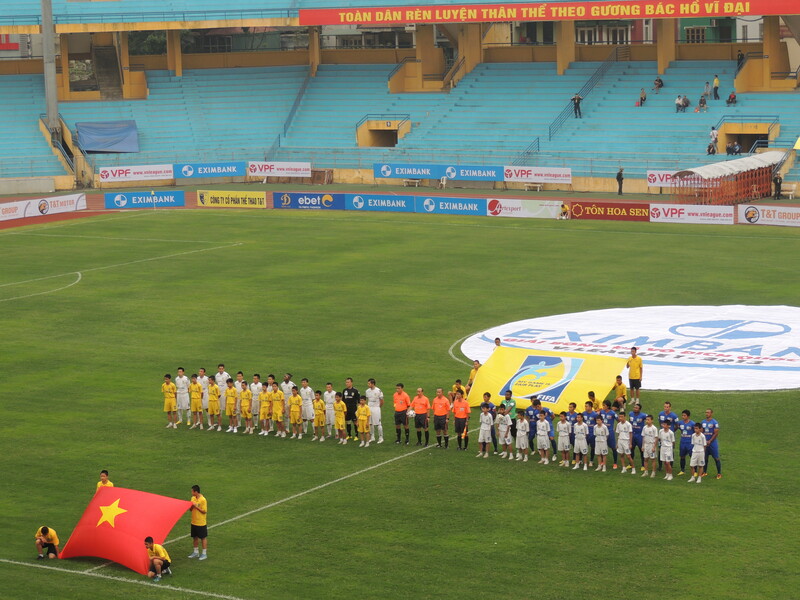 Next stop an away trip to Ninh Binh on Saturday 9th March, my first away day.